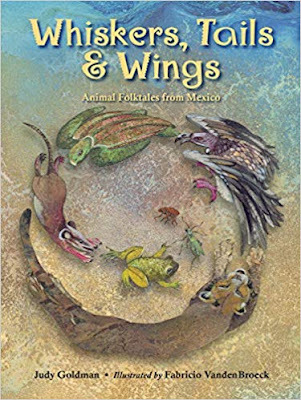 Goldman derived and attributes each of what she refers to as “animal folktales” to a historical anthropological rendition from a particular Indigenous nation in Mexico. From a perusal of the back matter, it’s apparent that she pored through collections of stories compiled by mostly Mexican scholars and cultural anthropologists, who themselves relied on historically sourced material. Along with source notes for her versions of these stories, she includes a bibliography of works in Spanish and English, and a list of web resources. Vanden Broeck’s detailed, full-bleed acrylic-and-watercolor paintings on heavily textured papers faithfully conform to Goldman’s retellings. Each illustration forefronts a particular story, and realistic picture-postcard vignettes on the information pages that follow portray the Indigenous people of each region, all modeling traditional dress. Judy Goldman is in love with Mexico, its people, animals, colors, traditions, and ancient stories. In her travels she’s always on the lookout for more stories, especially those about animals, that she can retell in her own way. Lois Beardslee: Mining anthropological sources that created the genre of “folktales” is a European American tradition of storytelling that wasn’t in our original Indigenous oral versions. Within this genre was the creation of a sub-genre of simplistic “animal stories,” (1) which tends to look at our environments objectively—without the feelings or perceptions or interactions that reflected on our own humanity. In other words, they’ve taken out all the human sophistication. In our traditions, stories featuring animals are actually people stories. They wouldn’t have been stories told by people if they weren’t about people and people’s needs. Our people stories utilize animals as part of our environments and part of our everyday experiences. “Animal folktales,” on the other hand, are a fabricated genre utilized by people who write children’s literature that enables a superordinate group to silence a subordinate group. Joe Bruchac: Brilliant, Lois! That’s a perfect way of describing this problem. Beverly Slapin: Yes! This reminds me of how Anne described her asking a young audience if they knew what raccoons ate, and someone said, “garbage!” Anne responded, she said, not with a correction, but by beginning her story with, “In the days before garbage…” because she wanted them to understand that raccoons (and humans, by extension) eat what is available to them. On the CIP page, Goldman acknowledges and thanks several individuals “for taking the time to read the nonfiction information, making comments, and correcting it.” Failing to acknowledge and thank any of the Indigenous peoples who own the millennia-old cultural capital to their stories strongly implies that she has neither asked for nor received permission from the actual owners of the stories to “retell them in her own way”—and to publish them. Mexico, a fascinating country made up of a unique blend of ancient customs and modern ways, is rich with such tales. Different native groups passed these tales from generation to generation. Though many people know about the Aztecs and the Maya, most have never heard about the other indigenous people of Mexico. Today there are sixty-two different native groups that speak as many languages, plus variations. The animal stories in this book are narrated by five of these groups: the Tarahumara, the Seri, the Huichol, the Triqui, and the Tseltal. By referring to Mexico as a “fascinating” country, using the past tense to refer to its inhabitants, and implying that they gave her permission to “retell” their traditional stories—Goldman’s dismissal and diminishing of the Native peoples of the south convey a sense of otherness and is cultural shorthand for colonial superiority. She writes: The lifestyles of these indigenous groups vary from member to member: Some continue to live as their ancestors did, while others have modern conveniences in their homes. Here, she ignores the fact that Indigenous peoples can and do generally live in both traditional and contemporary ways. But her either/or paradigm better suits Goldman’s über-romantic narrative than the realities of traditional peoples’ contemporary lives. Due to poverty some members of these groups have emigrated to [sic] big cities (and even to other countries) seeking work. As a result of being so far from home, they have lost some of their traditions. But others, especially those who still live in small towns and on farms in their native territories, strive to maintain their language, customs, and way of life. They love the land and what it produces…. Telling their stories is also a way of holding on to their traditions. Lois: Goldman is taking stories that have been written down, not necessarily written down accurately, and not conveying the traditional information that may have been present in the original. She’s imposing her own intent over all of the stories. In her own words, she conveys that her intent includes perceiving the Indigenous peoples of the south as simplified, distant, disconnected from their own cultures. She doesn’t see Indians living in cities that are on the sites of ancient cities where they have lived for millennia. “Due to poverty”—they just happen to be poor. And, she’s implying that Native peoples who live in big cities forfeit their right to cultural capital. But poverty is something that’s imposed, and it’s for the most part economic, not cultural. The question Goldman neither asks nor answers is this: Why are the Indigenous peoples of the south impoverished? Beverly: Yes, Lois. The “why” is a crucial issue that Goldman ignores. For Native peoples of the south, this impoverishment is a result of economic and political violence, and sometimes both. (2) It drives people away from their homes, often to the US, “into the mouth of the shark.” But being far from home does not necessarily cause loss of tradition, and Native peoples who are forcibly displaced do not love their traditional lands less than those who are able to stay. Lois: Talk about appropriation! Goldman seems to perceive herself as a cultural interpreter, yet she paints these people in such deprecating terms. They’re acceptable to her only as country people who live up to her stereotypes, as opposed to urban people, who have “lost” their cultures. Goldman’s introduction notwithstanding, cultures adapt to include immigration and migration, and urban living with modern appliances; and to assume that these cultures “can’t” successfully adapt to modernity trivializes them, lessens them, diminishes them. Goldman misses all this—or she chooses to erase it. The book screams “outsider cultural superiority.” That’s what the early cultural anthropologists did. Purposefully or not, they alluded to the subjects of their studies as inferior, which justified exploitation. Traditional stories, when written down, read as if they’re being told. Goldman’s dismissiveness of the people in the descriptive material is carried through in the stories themselves. They are reduced to something simple, devoid of both modest humor and compassion. Is she in love with the notion of docile Indians who graciously give away their cultural capital to people like her to “retell”? Joe: In doing this, she’s diminishing the right of people to name themselves. She’s opting for the language of either the enemy or the oppressor. The analogy that comes to my mind is quoting a bunch of Russian authors about Russian folktales as American folktales. These writers do not recognize the distinction between one Native nation and another as having the same significance as the difference between European traditions. Their cultural backgrounds are just not the same. One thing that many people do not realize is that the Grimm fairytales, in a number of cases, are not even German stories but were based on other cultural traditions, particularly Slovak. So the story of “Rumpelstiltskin,” for example, appears as a Slovak story, far before the Grimm brothers published it. So you see, that sort of cultural appropriation between dominant European cultures and other less powerful European cultures occurred well before this was done with our Native traditions. It’s a pattern repeating itself. Lois: In addition, using “animal stories” in this way gives Goldman a sort of “get out of jail for free card” that ignores the humanity of the peoples who created and continue to use these traditional stories and to avoid socioeconomic realities that include usurpation of these people’s cultural capital. Joe: It would have been much more difficult for Goldman to quote actual living people from those traditions. They might have had something different to say. That would have spoiled it all for her. Lois: Goldman apparently doesn’t understand. She doesn’t have to understand, because she apparently doesn’t see any value in understanding. Rather, the value is in producing and selling her books. Beverly: Anne, I know from first-hand experience that you’re a wonderful writer and even in our long telephone conversations, that you talk story in a way such that listeners hang on every word. Which do you prefer—to write the stories or to tell them? Anne Dunn: Some of the stories I write are told stories that I put in my books to make sure that they survive. These stories could be lost if they’re not written down, so we preserve them as they were written but not necessarily as they were told. A story is different when it’s told: You have an audience and you’re relating to the people and you can see their expressions as they’re relating to the story and probably to the storyteller. At that moment when they’re listening to you, there is no story without the teller. I think that’s because, in a written story, you’re not relating with an audience, you’re not looking into people’s faces. One of the reasons that I put them down in books is because I don’t want them to get lost. Maybe what I’m preserving is really a dead story. The story is only alive when you’re telling it. It travels on the breath of the speaker to the ear of the listener. It’s always the same story, but I enhance it for the specific audience. If I have children, I might ask them a question to involve them in the story. Sometimes I have to stop and talk to a child audience about a raccoon who is particularly hungry. I know some children don’t know what a raccoon likes to eat, so I get to expand on this: “There was a time before garbage…” and so we’re together again. Storytelling is a real art. It’s not just knowing the story—it’s the relationship between the story and the audience. I have the child audience in my hands. It’s a mental thing. I don’t want anyone to be lost—I want them to be with me. I’m an old woman who talks story. The community has to accept you as a storyteller and believe that you are a storyteller. Most of the stories that I know I’ve heard from other tellers, from my own family and even from my ex-husband. Every story that we tell is really part of an epic. I don’t tell any story verbatim from memory—I wait for my audience to respond and from their responses I find a way through the story. If I retell someone else’s story, I always ask permission first. I’m just a story-carrier. I once heard a Choctaw storyteller tell a story I really liked, so I asked his permission to retell it and he said, “fine.” But when I started to tell it to myself, the words stuck in my throat. His story didn’t want me to tell it. I couldn’t receive it. Does Goldman feel like she’s serving any good? I would wonder what her purpose is. Does she feel that she could tell it any better than the Indigenous tellers? Is she promoting the culture or promoting herself? These stories are better served by being left in the hands of their own people. And if their own people publish these stories, they will be published respectfully, as good as they know how, in their own compassionate ways. The stories transmit values. And the values are in the stories. You shouldn’t have to translate them. If you are successfully telling the story, then the children are with you. They don’t get away from you if you’ve got them in your hands. For instance, children will know without being told that the muskrat is operating on pride and the rabbit is operating on jealousy. All the storytellers, my ancestors, carried the stories forward a generation until they got to me, and I have to carry them forward to the next generation. And I have to do it in a good way. That’s why I feel that I have to tell the stories with compassion and commitment—commitment to my ancestors to tell that story that wants to be told, that must be told. As my mom would say, if you’re not prepared to give the story your best effort, don’t tell that story, just leave it alone. There has to be that give-and-take, that good creative energy flying back and forth when you’re telling a story. Lois: In our traditional stories, everyone understands the characters. We talk about them every day, even outside of the context of the stories. They’re part of our lives, our humor, and how we see and manage the world. For my mother, the teachings of the grandmothers and grandfathers and the village elders have intrinsic values and powerful meanings. …. Storytelling, then, occurs at every opportunity, and the elders usually use those events to instill moral values and open-mindedness in the audience. These stories, despite their importance as moral teachings for Mayan children, are also expressions of a millenarian tradition that has come from the deepest soul of the Mayan people. Some of the stories… are very old, and they continue to be passed on while being shaped to suit the current historical situation. Other stories have been created in a more recent Mayan historical time and have incorporated western elements in their structure…. Since (the Spanish invasion), the Mayan storytellers have made use of these elements as material available to them in their collective creations. This creativity can show us that the present Mayans are also dynamic actors in the creation, recreation, and maintenance of their own cultural traditions. Joe: I am glad you mentioned my friend Victor for a couple of reasons. The first is that he is an actual Indigenous storyteller from south of our American borders. The second is that when I first met him several decades ago, he was a refugee who was fluent in Jakaltek and Spanish, but could speak no English. Not only did he master the English language, he went on to earn a PhD in this country, write a number of brilliant books in English, and become a respected professor. I challenge those non-Native people who are colonizing our stories to prove that they have the same level of intellectual ability and tenacity by gaining — if not deep fluency in the actual languages in which those stories were first told, as Victor did with English — at least enough knowledge of those languages to truly appreciate their worldview and complexity. Lois: I remember sitting next to a teddy bear on a couch, along with a four-year-old and I looked down at the bear and said, “Gawiin! Gegoh nmaadabikehn dbiishko mokwaa!” (“Don’t just sit there like a bear.”) The adults in the room laughed. They all knew that I was referring to multiple nuances about the implications of laziness, of sleeping in or being like a bear. Of course, this comment wouldn’t have meant anything to anyone who didn’t understand its cultural tie-in. Goldman’s “retellings,” on the other hand, lack the cultural contexts in which they’re traditionally told. They lack any nuance that would tie them to their cultures. Rather, they have been reduced to the mere antics of their animal participants—a canned one-size-fits-all format in which the cultural context is removed and the bare bones of a lesson (if any) remain intact. lt’s like filleting a fish and throwing away the flesh. These stories got no flesh! Beverly: Exactly, Lois. 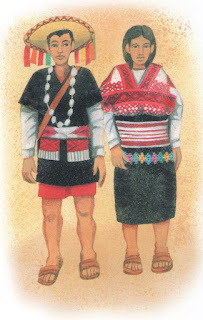 For instance, in a traditional Rarámuri (“Tarahumara”) story (in this case, “How Señor Grillo Met Señor Puma”), it’s highly unlikely that Indigenous storytellers with their own language structures would have animals communicating with each other in their own languages and in Spanish (“¡Eres un cobarde!”), a foreign language—which Goldman italicizes, which calls more attention to the improbability. But Goldman is not doing anything new. Her overlaying of this formulaic method of telling stories from the eyes of a cultural outsider has been used in children’s books for more than a century. It’s a throwback marketed today as multicultural children’s literature. Lois: Yes. By taking the bare bones information—how this or that physical characteristic came about, for instance—without fleshing out the characters takes the humanity away from the story. This simplification is transferred to perceptions about the Indigenous people who “told” this story. Even if the simplification had been done by a certain ethnographer rather than by Goldman, it probably would still have had the same effect—to make people look foolish. There’s certainly no shortage of Indigenous people on both sides of the border who can tell these stories and flesh them out in a way that demonstrates the beauty and dignity of the people who own the stories. Barbara Wall: Remember, Beverly, several years ago, when you and I attended an educational conference that showcased “multicultural” children’s books? We sat together and listened to one of the speakers, a famed storyteller and artist who, by audience reactions, was adored by elementary school teachers. During Q&A time, I stood up and identified myself first by my name, then by my Native nation, then by my educational vocation, and finally, by the fact that my grandfather had been a survivor of the notorious Carlisle Indian Industrial School. I was shaking, and had to hold on to my seat to steady myself. I took a deep breath and asked this beloved author and artist a brief question, something like this: “What gives you the right to extract and erase what belongs to Indigenous peoples?” Without missing a beat to consider what I had just asked him, he answered: “Oh, so are you saying that Indians have cultural copyright”? I don’t remember the audience’s immediate reaction, but after his talk, conference participants lined up to talk with him and to ask him to sign their books. Joe: Many non-Native authors and publishers know that traditional Indigenous stories are relatively easy to harvest and translate into something for non-Indigenous children and their teachers to read. Many times, they misname these stories as “fables,” “fairy tales,” “folktales,” “legends” or “myths”—all Western constructs (5)—and transform them into money-makers. The purpose of traditional Native stories is, for the most part, to portray the Original Instructions: to build relationships between all the beings of creation, to tell how things came to be the way they are, to teach right relationship between and among humans and the other animal people, and sometimes to model proper behavior by demonstrating improper behavior. Lois: Yes. There’s nothing simple or “primitive” about traditional Indigenous stories. They’re often pragmatic and teach survival skills; they’re often grounded in sciences such as biology; and they’re often embedded with sophisticated knowledges. There are beautiful stories, gruesome stories, stories that are preventative in nature, stories that hint at responsibility, stories that meet the needs of the audience and their storytellers; and they’re varied with each telling. The stories Goldman’s written here meet her needs—rather than the needs of the communities who traditionally tell these stories. She doesn’t necessarily know these stories because she doesn’t have to. Rather, these “folktales” remind me of the old game of “telephone”—they’re removed from the people and changed so much that they’re no longer legitimate culturally connected stories. Barbara: Our stories have different levels and meanings: a superficial level—literal or metaphorical (for young children), and a deeper meaning—philosophical or spiritual (for older listeners). It seems that Goldman is telling only the superficial level of these stories—which she has changed to “retell in her own way”—because from her colonial viewpoint, she neither has nor needs any understanding of the philosophical or spiritual components of these stories. And, even if she had understood the deeper components, she would probably have considered them unimportant to her project. Judy Goldman is in love with Mexico, its people, animals, colors, traditions, and stories. In her travels she’s always on the lookout for more stories, especially those about animals, that she can retell in her own way. Stories are not just entertainment. Stories are power. They reflect the deepest, the most intimate perceptions, relationships and attitudes of a people. Stories show how a people, a culture thinks. Joe: Within the structure of traditional Indigenous stories there is often a distinction made between a story about an event the teller knows firsthand (“I experienced this”) or a story about an event the teller does not know firsthand (“This is a story that was told to me”). Although it would be obvious, for instance, that a story-carrier would not personally have experienced a creation story, or a “how-it-came-to-be” story, or a “trickster” story, the distinction would still be clearly noted. Beverly: While it’s clear that Goldman’s hunt included research (with several sources for her version of each story), her outsider bias is evident everywhere. In her index, for instance, she refers Indigenous names back to listings of their colonially imposed Spanish names (e.g., “Wixaritari, see Huichol”). Her sources are almost all in Spanish; and throughout, she presents Native peoples as “other,” consistently peppering her English-written versions with italicized Spanish words and phrases. Such wonderful offerings are seldom reproduced by outsiders…. Cultural insight, cultural nuance, cultural metaphor, cultural symbols, hidden subtext—give a book or film the ring of truth. Images coded with our meanings are the very things missing in most “native” writing by non-Native authors. These are the very things that give stories their universal appeal, that allow true empathy and shared emotion. That night…Señor Grillo composed an epic poem narrating their triumph, and then he set it to music on the spot. Since then, crickets sing that song every night to remember Señor Grillo’s victory over Señor Puma. Joe: Our Indigenous stories are often embedded in the natural world, so if you read a traditional story with natural references in it, it will probably be accurate—you recognize that certain things will happen in the natural cycle. But most of these people who are rewriting our stories know nothing about nature and as a result they can misinterpret or misrepresent the simple song of the cricket as an epic poem. Crickets don’t compose epic poems. The animals stayed in the water all day until night arrived. At last they came out,… all the people of the claw. They stepped very softly and quickly, going to the forest with no desires ever again to battle with the insects. Yaquis say that there is no small enemy. Everyone can defend himself. The cricket continues to sing,“chik chik chik.” He is not afraid. It seems that there are more things going on in this story as recorded in Goldman’s source notes than she sees as worthy of including in “her own retelling.” The Yaqui version of the story—even written down by someone from outside the culture—seems to be about the Indigenous struggles against colonialism, about power and resistance. What makes white Canadians and Americans think they are privy to the stories of First Nations people, anyway? And why is speaking for ourselves and telling our own stories so threatening to them? Because stories are power? They have the land now, or so they think, do they now want our stories, our voices, and our spirit, too? Beverly: A brief examination of Goldman’s references suggests that even the tribal affiliations of her stories are suspect. 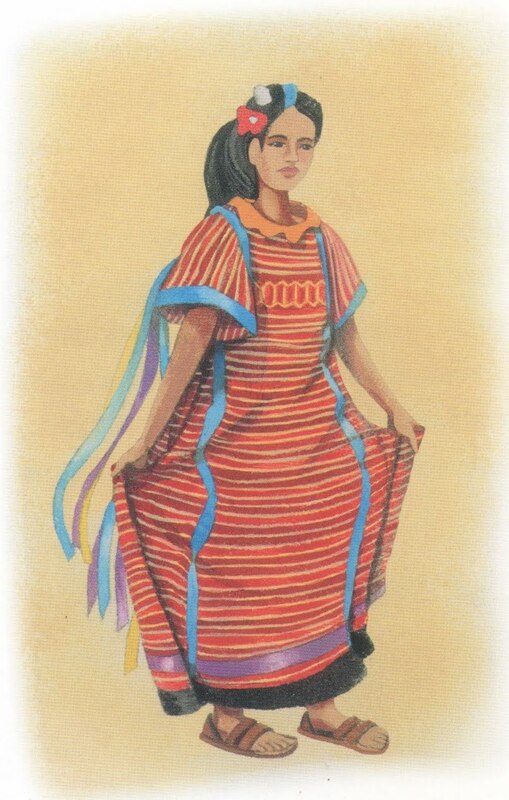 (For instance, she cites Yaqui Myths and Legends as a source for her “Tarahumara” tale.) Story-mining in anthropological journals is not the same as interacting with Indigenous peoples. That her presentations of the stories reflect her characters with stereotypical names and behaviors points to Goldman’s simplified perceptions of the peoples from whose cultures the stories originate. Lois: Yes, the sources she lists are many times removed from the cultures she purports to represent. Each of Goldman’s tales is canned, cute, a formulaic length, and illustrated to appeal to a certain (non-Indigenous) child audience. Beverly: That Whiskers, Tails & Wings has been praised by just about all the professional review journals—even given a starred review by one—belies the many problems here. All of these uncritically positive reviews focus on the product and not the process. It’s only the product that wows the reviewers, and there’s nothing behind the product. In focusing only on the material elements, there is no critical thinking about a colonial process that still continues. There are numerous problems here that the reviewers apparently didn’t notice. For one thing, portraying all of the Indigenous people modeling gorgeous, traditionally hand-woven clothing erases their contemporary, often difficult, lives. As with her stories, Goldman’s Indigenous people are frozen in time. As to sitting cross-legged on the floor—traditionally called “criss-cross applesauce” among all us Native folk—I have no comment other than to compliment the artist on his apt use of clichéd imagery. Lois: The issue here is not merely about each individual story. The issue is that Goldman is mining Indigenous stories, digging into and taking away the heart of a people—and being praised for it. 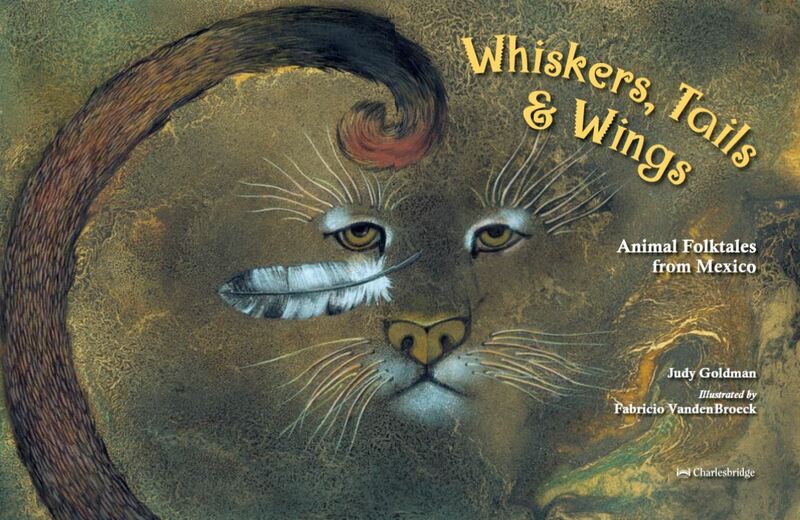 Whiskers, Tails & Wings is not recommended. We can do better for our children. and jumbling up our histories. are the ones they disfigure. that might inspire us to break the silence. which has made us forget our names. Author and illustrator Lois Beardslee was raised by wolves, the alpha female of whom was Lake Superior Ojibwe and the alpha male of whom was Lacandón, Maya. She grew up and raised her children between family farms in Northern Michigan and remote bush camps in Northern Ontario. She eats a lot of moose meat tamales and lake trout burritos. Anne Dunn is a grandmother, storyteller, poet and author, and a citizen of the Anishinaabe-Ojibwe Nation. She lives in the woods of the Leech Lake Reservation with her cat, Fred, who sleeps a lot in the winter and shares with her his myriads of great ideas in the summertime. Beverly Slapin is a lifelong learner and education activist, who, for decades, has worked at deconstructing racism and stereotypes in children’s literature. Her cat, Zeytun, insists on occupying Beverly’s lap when she’s on the computer, causing innumerable typos. Barbara Wall is a Bodwewaadmii Anishinaabekwe, mother, sister, daughter, auntie, Grandmother, grieving widow and land/water defender. She lives in southern Ontario where she is perfecting the art of productive procrastination by growing traditional foods, teaching, making maple sugar, and participating in book review conversations rather than finishing her dissertation. We produced this collaborative review-essay through multiple telephone and email conversations. Thank you, all! And many thanks to Lenore Keeshig-Tobias (Ojibwe) and Victor Montejo (Jakaltek Maya) for your work. (1) Indigenous “animal” stories often demonstrate irony and humor; and may uncover profound character and personality traits, extreme actions, and sometimes terrible ideas. (2) For instance, The US-imposed economic policy known as NAFTA privatized communal Indigenous lands and flooded the Mexican market with cheap US corn, resulting in the impoverishment and displacement of tens of thousands of Native farm families, who were forced to immigrate to the US and become low-wage workers. (3) Victor Montejo is a retired professor of Native American Studies at the University of California at Davis. He is trilingual and tricultural (his first language being Jakaltek, one of 31 Mayan languages spoken in Guatemala, southern Mexico and Belize) and studies in depth his own Jakaltek Mayan people. (5) Let me be clear: The fact that these labels are Western constructs doesn’t mean that what’s inside a particular book labeled as such is always something to be tossed. It’s just a clue. (6) Lenore’s essay was first published in B. Slapin and D. Seale, eds., Through Indian Eyes: The Native Experience in Books for Children. New Society Publishers, 1987. (7) Warner Giddings, Ruth, “The Cricket and the Lion,” in Yaqui Myths and Legends. Tucson, Arizona: Anthropological Papers of the University of Arizona, 1959. Wow, fascinating & informative conversation, everyone! Getting ready to share the link on FB!